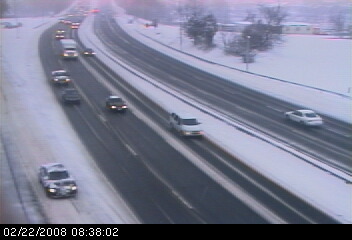 Photo from ConnDOT's I-95 Bridgeport Area Exit 17 webcam. I have to go out and get killed by a snowplow tonight. Don't panic -- it's for a film I'm in. I'm a fan, just based on that commercial. Keep me posted please? And if you have any photos of the shoot, I'd love to see them. It is snowing in Buenos Aires, tambien!